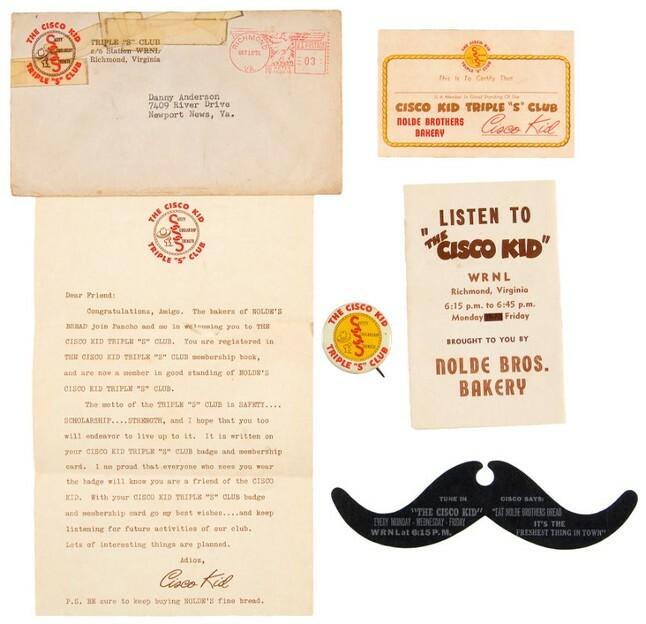 THE FILM, RADIO, TELEVISION, AND COMIC BOOK SERRIES, The Cisco Kid was loosely based on the fictional Western character created by O. Henry in his short story The Caballero's Way. 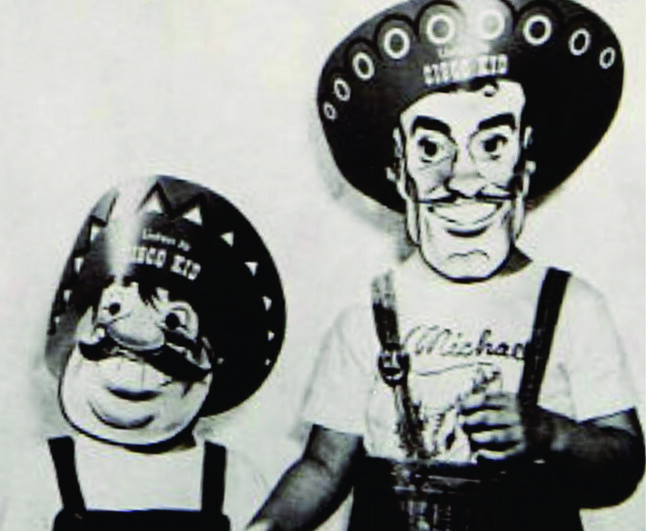 In 1939 The Hispanic hero established public prominence through a movie series, The Cisco Kid and the Lady with Cesar Romero in the title role. Duncan Renaldo took over the film role in 1945 with The Cisco Kid Returns. Meanwhile, the Mutual Broadcasting System brought the popular character to radio on October 2, 1942. Jackson Beck* played the title role and Louis Sorin was Pancho; the program continued until 1945. 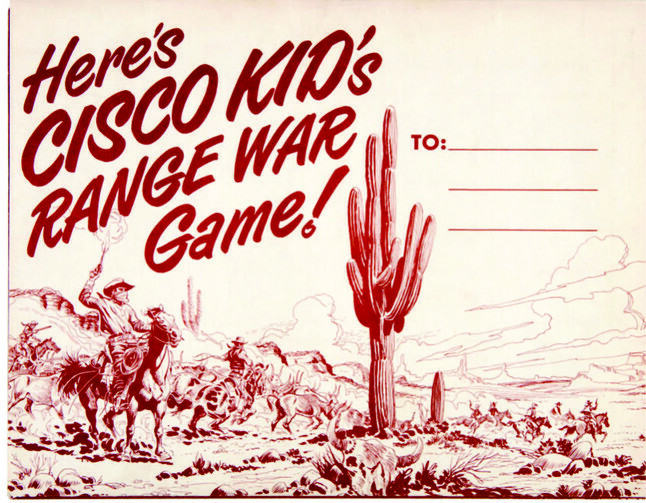 The Cisco Kid was a western drama series with a plot line that greatly appealed to children. Cisco and his sidekick Pancho were two carefree bandits who enjoyed stealing from evil, rich people and using the money to help the poor. In fact, the announcer would often refer to Cisco as “The Robin Hood of the West.” During its run, the program aired at least once and as many as three times per week. "Meanest Man in Arizonia," which was broadcast on July 24, 1952. 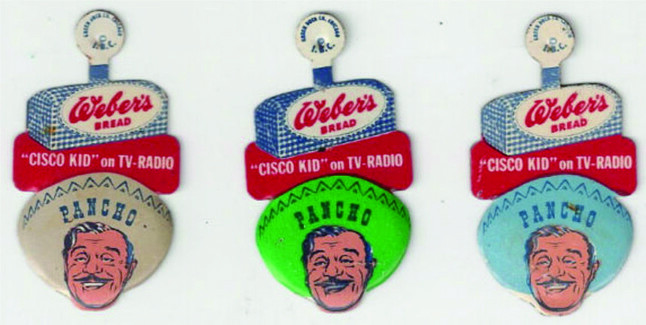 PANCHO WAS ONE OF THE BEST SIDEKICKS IN OLD-TIME RADIO. Half the fun of listening to the series was hearing the likeable, but simple Pancho rattling on in mangled English with a sense of humor that was as wide as his belly. He was obviously a lover of food while Cisco, a handsome dashing hero, had an eye for the fair senorita in distress, who always fell madly in love with him by the episode’s end. The duo often were mistaken for outlaws themselves; but they were smart enough to use this to their advantage and get in and out of trouble easily. 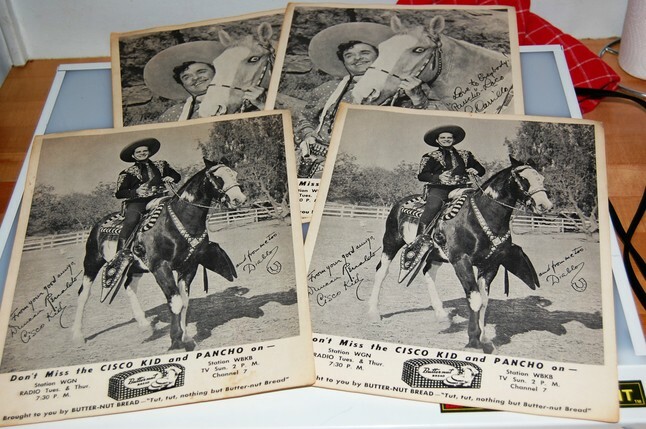 Cisco and his partner Pancho rode off the Mutual trail on December 14, 1945, but the characters returned to the airwaves two years later in another version that was broadcast over the Don Lee Pacific Coast Network. 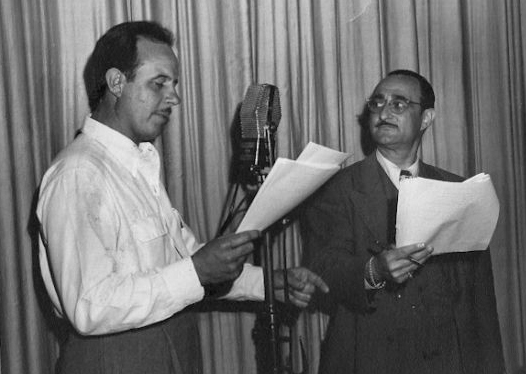 Jack Mather and Harry Lang (later replaced by Mel Blanc) portrayed Cisco and Pancho in the new program. Starring in more than 600 episodes of the syndicated radio series, they continued in their roles until the show's end in 1956. In 1950, Duncan Renaldo resumed his role as the Cisco Kid for 156 episodes on television; his sidekick, Pancho, was played by Leo Carrillo. The program was one of the first television series to be filmed in color; however, most viewers of the original run saw the program in black-and-white. In 1956, the year the television program ended, only .05 percent of U.S. households with a television set had a color set. When color television became more common, the series was in demand until the 1970s. 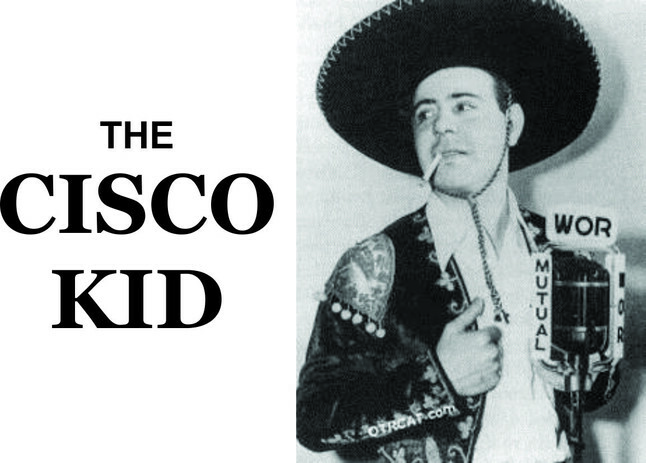 The Cisco Kid also was the first television show to feature Hispanic stars in leading—though heavily stereotypical—roles. Roaming the Old West on a black and white horse named Diablo and accompanied by his constant companion Pancho, astride Loco, the duo always helped where needed and foiled treacherous bad men with their daring stunts and ingenuity. 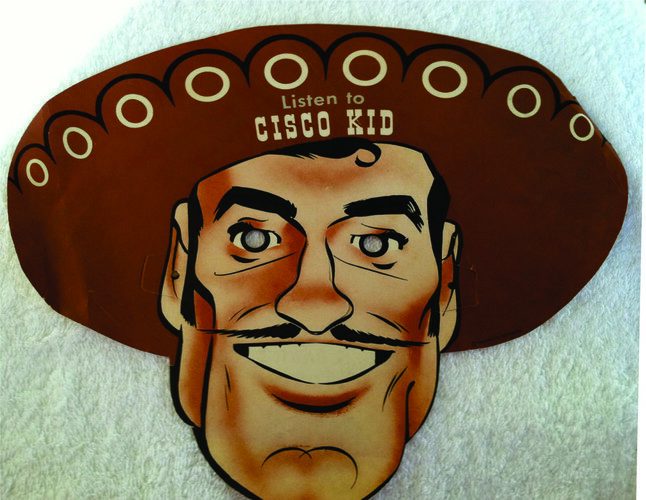 In a 1994, after a long absence, The Cisco Kid galloped back onto television screens in a made-for-TV movie starring Jimmy Smits in the title role and Cheech Marin as Pancho. Like the television episodes before it, the movie ended with one of the loveable rogues making a corny joke about the adventure they had just completed. Laughing together, they’d say, "Oh, Pancho!" 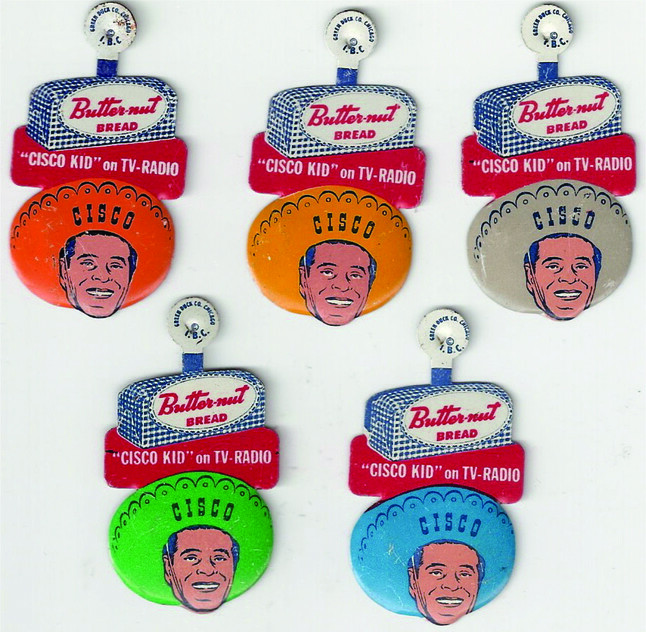 "Oh, Cisco!" Then accompanied by Spanish-styled Western music, they would gallop off into the sunset as the credits rolled. *Jason Beck - pictured above - the first radio voice of the Cisco Kid, was also the announcer for more than 1600 episodes of the Superman radio show. When you hear the familiar, “Up in the sky! . . . It’s a bird! . . .” that’s Beck. Large, bright, silver-colored aluminum ring with adjustable bands and extensive detailing on the saddle sides and front. The seat area is a separate piece of metal and has the name "Cisco Kid" in raised letters. 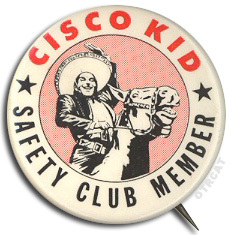 Button is red reads "Cisco Kid Rancher" and has the image of a Longhorn steer. 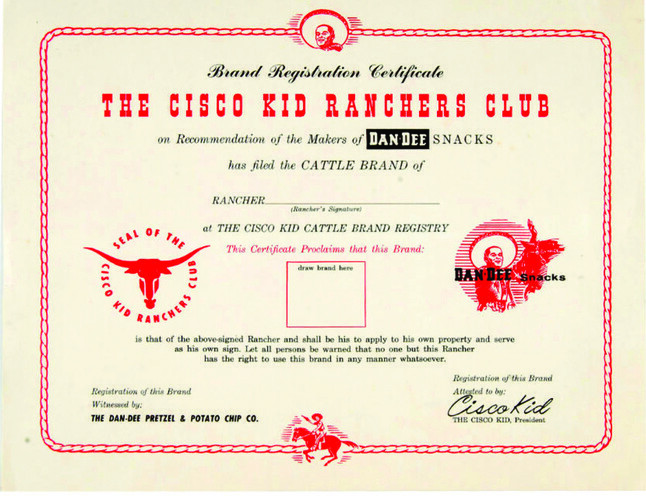 Large certificate, 8.5 ' x 1," has space for Rancher's Signature and space to drawn his/her personal brand design. 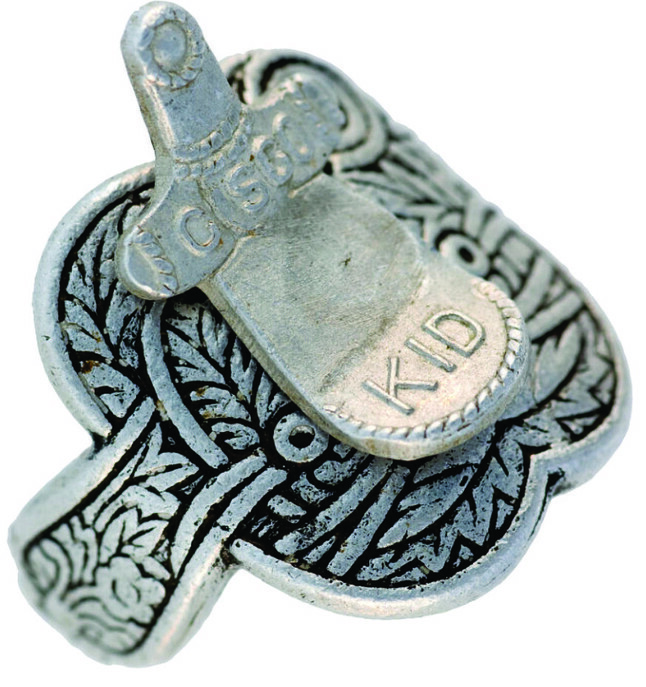 Right side has image of Cisco smiling and waving from horseback; and border has rope design with image of Cisco, gun drawn, riding on horse on bottom. Photo on front is TV's Cisco waving from horseback on simulated TV screen; the back has photo of him smiling and waving from a rearing horse. 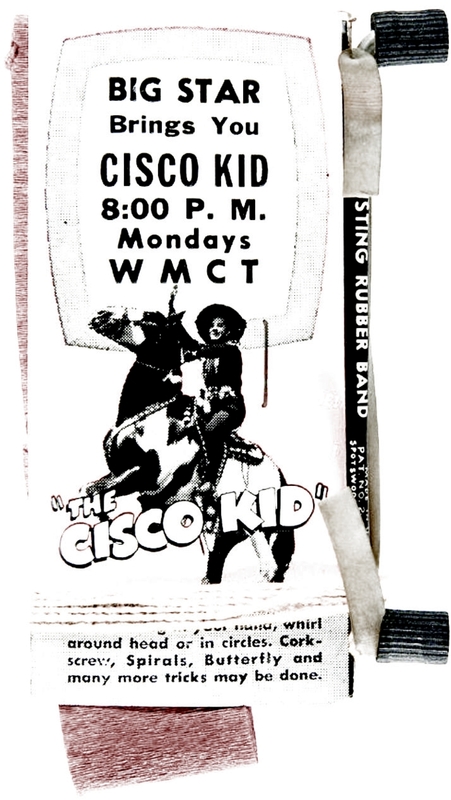 Text at top reads, "Big Star Brings You Cisco Kid 8 PM, Mondays, WMCT." 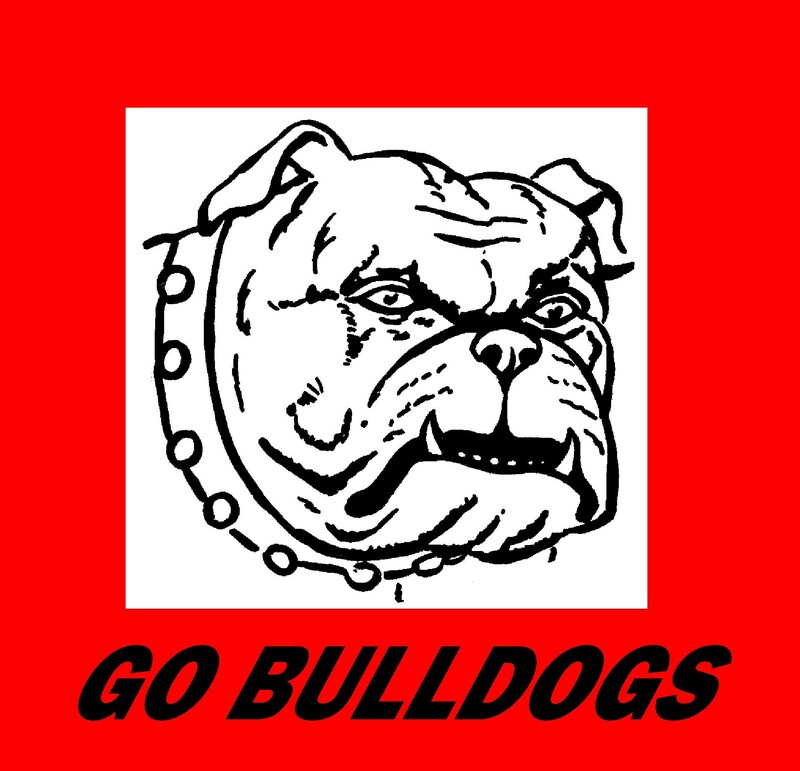 (Call letters refer to station in Tennessee.) Lariat is made of string and a streamer roll of crepe paper to "Execute The Thrilling Rope Tricks Done By The Famous Cisco Kid and His Side-Kick Pancho," as advertised. 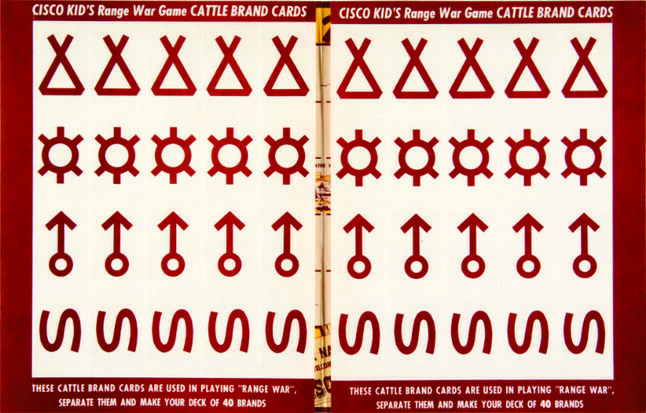 Folder holding game pieces and instructions has Cisco's image on front with cattle rustlers on horseback and space for address. 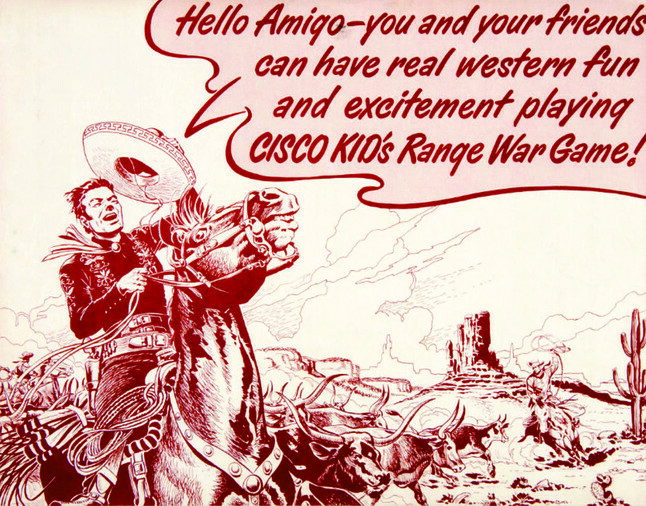 Reverse side has Cisco on horseback and sombrero in air with word balloon text "Hello Amigo - You And Your Friends Can Have Real Western Fun And Excitement Playing Cisco Kid's Range War Game!" Folder opens to reveal two pages of cattle-brand cards and opens again to full width of 34 inches. Elaborate designs cover the game board and cattle-brand punch-out cards. Squeeze the handle and hear the clicker sounds! 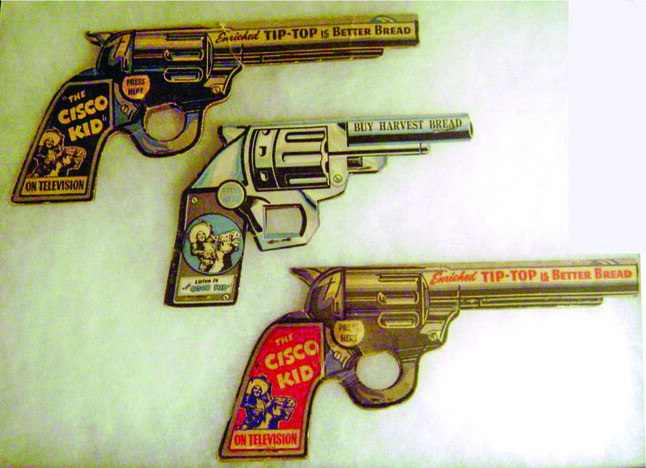 These Cisco Kid Cap Guns are almost like the real cap guns you carried as a child.